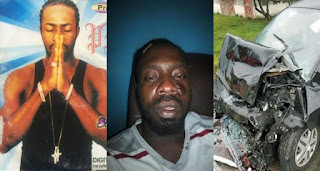 Popular Nigerian artiste, Sky B, was involved in a ghastly car accident and according to online sources he escaped by the whiskers. Facebook user, Angel Attah who shared photos from the accident scene in Port Harcourt, Rivers State, asked friends to pray for the quick recovery of the singer whose car was badly damaged. In the 2000’s Sky B was about the biggest new kid in Nigerian music at the time. Sky B’s accident is coming when Nigerians are still mourning veteran singers Ras Kimono and Moses Ochie of ‘Fellyx and Mozzyx’ fame. While Ras Kimono died after reportedly slumping at the airport, Moses died in his Lagos home, after battling with a chronic kidney ailment for seven years. He was reportedly diagnosed with the ailment on Christmas day in 2011. He was preparing for a kidney transplant and hip bone replacement surgery before his death. His death was confirmed by the board and management of Copyright Society of Nigeria (COSON) who described him as a very talented and committed member of the society. Coson’s Head, Corporate Affairs, Chibueze Okereke, said the society took active steps to generate resources to support his treatment, but he passed on before the treatment could commence.